Amazon Coatings~17 Years & Going Strong! Amazon Coatings LLC – Established in 2001 in Mesa Arizona. Local, family owned and operated concrete coatings business. Service area limited to the East Valley so that we can provide you the best service possible! New Home or Old, we will work with you to determine the best coating for your home or business. New Coatings, repairs and re-seals. Always commercial-grade materials. 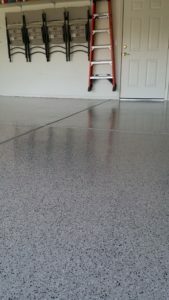 ~ Garage Floors – Epoxy, Polyurethane, Vinyl Chip / Speckled Coatings – NOT just Paint! ~ Swimming Pool Decks – When was the last time you re-sealed your deck? Did you know you can extend the life of your coating by cleaning & resealing on a regular basis? Contact us today with your questions; we’re always ready to help! 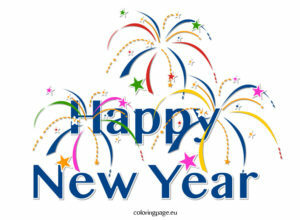 Wishing all of you a Happy New Year and thanking all those who have made this past year a success for us! Without you, there would be no Amazon Coatings. Remembering all who have served so that we may enjoy this day. Wishing peace and family fun this 4th of July Holiday to all! We’ll be back in the office tomorrow, July 5th. Don’t forget to check out our new monthly special; Lace Pool Deck Clean & Seal. Always Free Estimates on Decorative Concrete Coatings! Whether you’re looking for a garage floor epoxy coating, flagstone coating for your patio or to re-seal an existing coating on your swimming pool deck, Amazon Coatings, LLC will always provide an a Free Estimate! Want a garage floor like this one? Easy to clean, a sealed surface that won’t hold dirt, oil and liquids wipe up with a paper towel! With less dirt on your garage floor, you’ll minimizes the “tracking” of dirt into your home. To top it off, it just plain “looks good”. We can do that! 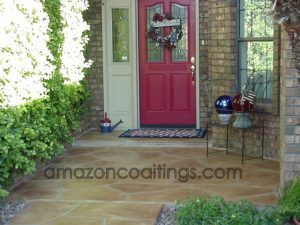 Amazon Coatings, LLC can update the look of your patio with a new coating or re-seal of an existing concrete coating! Maybe you have a painted driveway coating that needs some help; faded, peeling or maybe you just want to update the color. We can do that! Whatever your need, take that one step to make your dream come true. Always Free Estimates!! 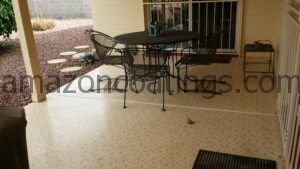 Amazon Coatings, LLC, providing Decorative Concrete Coatings for the last 16 years to the Phoenix East Valley!! Won’t you contact us today? 480-890-1141 or fill out the form below and we’ll contact you. While you’re here, take a look around our site; we’re proud of the work we’ve completed over the years. If you’re in Mesa, Chandler, Gilbert, Queen Creek, San Tan Valley, Apache Junction, Gold Canyon, Tempe or surrounding areas, we’re Your Decorative Concrete Coating Company!! So you’ve been looking at that outdated coating on your patio floor (for longer than you care to admit) and have decided it’s time to refresh your patio / pool deck with a new look. Maybe it is faded, damaged and peeling or maybe you’re “just tired of it”. Well, now is the time for change! It’s spring and time for all things to be beautiful again. Let’s talk about a project we recently completed in Mesa, AZ. The existing concrete coating was the old style, painted “Design Roll”. If your contractor applied the coating using quality materials, or it is in an area that is protected from the harsh Arizona sun, then it may still be in reasonable shape, just outdated. That was the case with this project; it was not necessary to remove the existing coating. Our customer had a small area that was damaged, but really wanted an updated look. Vinyl Chip mimics the look of granite! We applied our Vinyl Chip Coating System; it mimics the look of granite. Its a nice clean look, and easy to take care of. By using the right base and chip colors, you can “camouflage” dust and leaves that blow onto the deck until you have the chance to clean it. Our homeowner couldn’t be more pleased. They now have an updated look that is easy to clean and will provide them years of enjoyment. Due to the quality of our floor coating materials, our customer will not need to re-seal their floor for 5 years or more. If you are interested in updating the look of your patio, garage, pool deck or driveway, don’t wait any longer. Contact us today for your free estimate. 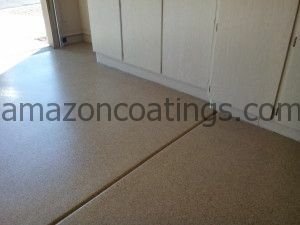 Amazon Coatings has provided decorative concrete coatings in the Phoenix East Valley since 2001. Proudly serving Mesa, Chandler, Gilbert, Tempe, Apache Junction, Queen Creek, San Tan Valley and Scottsdale. Call us today @ 480-890-1141. 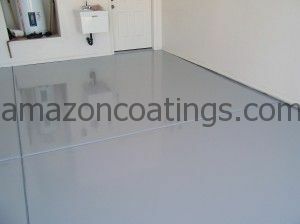 Don’t forget our website at www.amazoncoatings.com. Always Family Owned and Operated…. Check us out further at the Better Business Bureau and Arizona Registrar of Contractors. Thanks so much to Bob & Sylvia in Mesa for those kind words and the referral to their son. We applied our Textured Overlay Tile Coating on their back patio using soft, natural colors to compliment their surroundings and a High Performance, Chemical Resistant Vinyl Chip Coating System in their garage. Rafael and I are so please to be celebrating Amazon Coatings’ 15 year anniversary this year! We’ll be sharing, from time to time, some of the great letters and comments we’ve received over the years. If you’re interested in updating the look of your patio, pool deck or garage, be sure to contact us; estimates are always free. We’ll work with you to design a look that is both functional and appealing. You can get ideas for your ideal concrete floor coating by viewing our Portfolio… Just “click” on the different floor coating galleries on the side of this page. All photos show are work completed by us! 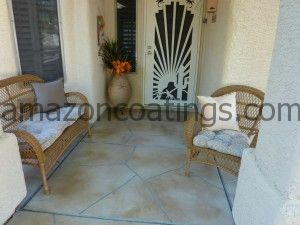 Amazon Coatings, LLC, proudly serving the Phoenix East Valley Cities of Mesa, Chandler, Gilbert, Tempe, Apache Junction, Gold Canyon, Queen Creek, San Tan Valley and Scottsdale. Call us at: 480-890-1141 or use our Contact Form to obtain more information. New Home Garage Floor Coating ~ What to know! So you’re moving into a new home. When is the best time to have a protective garage floor coating applied? Before you move it! That is, if you have the luxury of time on your side. 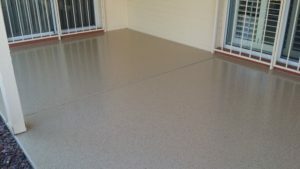 The garage floor coating application is a 2-4 day process, depending on the coating system you choose. There are even 1 day coating applications, but they generally will cost a bit more. Your new floor will typically allow light foot traffic 24 hours after completion and vehicle traffic after 7 days. There are coating systems that will give a quicker dry time, but again, there is a cost for the convenience. When moving into your new home, be cautious of placing cardboard boxes on a new floor coating that has not reached the optimal cure time. Moisture can be trapped between the box and floor. There have even been cases where ink on a printed box has transferred onto the new coating. These cases are rare, but, it’s wise to heed the dry time guidelines from your installer. It is also a good idea to ask your mover to use cloth tarps when rolling furniture dollies in and out of your home through the garage. This will help minimize your new floor being accidentally scratched. As an entry level, all around GOOD coating, you can’t go wrong with an Epoxy and Polyurethane coating. This is a 2-coat, solid color thin film system. 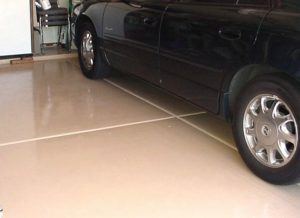 This garage floor coating system provides great scratch resistance, heat resistance and an easy to clean surface. Oils, etc. will wipe up with a paper towel. 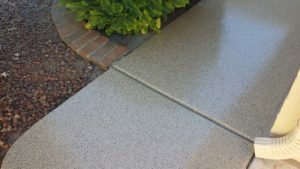 For more information on this and other concrete coating systems go to our website at www.amazoncoatings.com or give us a call 480-890-1141. Amazon Coatings LLC, your local, family-owned and operated Concrete Coatings Contractor. Serving Mesa, Chandler, Gilbert and surrounding Phoenix East Valley locations! What conditions will the surface be exposed to? Will the area be used primarily for foot traffic or vehicle traffic? Is the area indoor or outdoors? Will the surface frequently be exposed to water? What type of finish are you interested in? A sealed surface is a slick surface, but…. We apply non-skid particles in all of our coatings to minimize the risk of slips and falls. 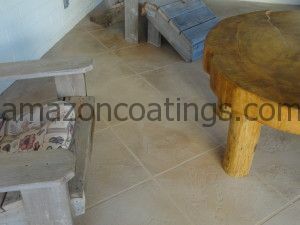 In addition, if the coating being applied is an overlay; such as a flagstone or tile coating, the final texture of the surface can be adjusted for the intended use. This is especially useful around swimming pools. What is the life expectancy of the coating? The use of a high quality sealer is a must, especially if the coating is applied outdoors or receives vehicle traffic. Make sure the sealer being used is UV Stable so your coating won’t turn yellow in the sun. Different sealers provide different life expediencies. We learned “early on” that it is better to charge “just a little more” and use the best concrete coating sealers! You won’t be seeing us every year or two for re-seals, our sealers are designed to last 3-5 years or 5-8 years depending on intended use and color. Don’t be fooled by a cheap price….. it normally means cheap materials and a short lifespan for your coating! The heat has arrived and time to hit the swimming pool. Your pool has been cleaned and the water chemically balanced….but, what about your swimming pool deck? Hose off your deck and give it a quick check. Is the deck stained? Is the coating starting to peel or flake? Do you see cracks in the pool deck? With just some simple care, you can extend the life of your decking, help minimize costly repairs and keep your deck cool! Ready to have your pool or patio deck coating sealed, cleaned or repaired? Or maybe you’re just ready for a change. Don’t start your summer swimming season with an ugly pool deck. We are here to help! 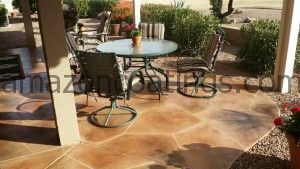 Amazon Coatings has provided decorative concrete coatings to the Phoenix Valley since 2001. Contact us TODAY!! Remember, stay safe and cool in your pool!